Worship is our response to who God is and the act of ascribing worth to Him. We are called to passionately worship our Savior, and we strive to do that through high-impact worship services each weekend. 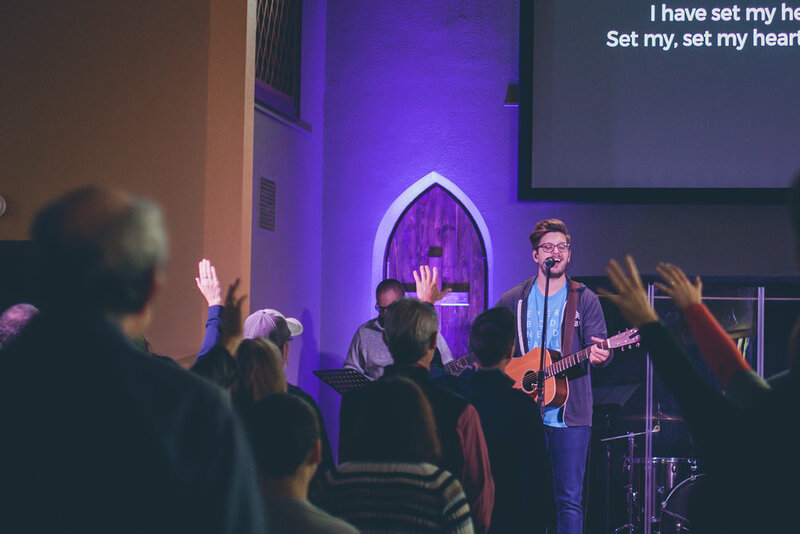 Giving God glory and ascribing Him worth is the core of Harvest worship. Worship is our response to the grace and love that God has shown us, and singing praises to the Lord is one way we can express our gratitude. Worship can occur in many different forms and should be happening every time we gather in His Name. One of the pillars at Harvest Bible Chapel is lifting high the name of Jesus in worship. Our aim is to give unashamed adoration to our God and King. We do this through music, art, songwriting, storytelling, video, photography, sound, and any other medium we can use. God has poured His creativity all around us, and we strive to reflect the glory back to Him. The worship ministry of Harvest exists to help our people experience the sufficiency and express the supremacy of Christ in all things. Our doctrinal statement on worship is available here. One way we worship at Harvest is through singing His praise. However, the act of simply singing songs is not necessarily worship; instead, it is our response to the grace and love that God has shown us. Singing praises to God is a command to all followers of Christ. "Shout for joy to God, all the earth; sing the glory of his name; give to him glorious praise! Our worship at Harvest includes singing and playing instruments, but the message that our songs communicate is the most important aspect. Our songs should accurately reflect what God's Word says and should describe the character of God. Whether the music is slow or fast, soft or loud, new or old, with a full band or without, matters very little in comparison to the message of song. We strive to lead our church in worship through a variety of genres and styles, of music. Not for the sake of appeasing demographics or personal preferences, but to show how the glory of God can transcend personal taste and preference. You must be a believer in Jesus Christ. Harvest Bible Chapel must be your home church. Read the information below explaining the process and participation on the worship team. We have a vision for continuously increasing our worship ministry at Harvest Bible Chapel. Auditions are a practical tool for evaluating the skills and heart of people who feel called to serve on a worship team. If you have a heart to lead others into meaningful worship and you feel you are skilled with your voice or musical instrument, we would love to get to know you! All vocalists and instrumentalists should view the AUDITIONS section to prepare for the audition process. Harvest must be your home church. You should be in agreement with our theological standings, doctrine, and values. We are looking for trustworthy, team-minded people who will take the commitment seriously. Maintaining a humble, teachable attitude is very important. The worship team is not a platform for showcasing individual talents, but a place of service to the congregation. There is a standard of purity and holy living that is also expected of worship team members. None of us have arrived at perfection, but there needs to be a strong correlation between what you profess on stage and how you live. Whether we like it or not, people are watching us as worship leaders and our witness is very important. (This includes what we post on social media.) Previous experience on a worship team or in a band can be helpful but is not required. We currently provide worship for two services: Sundays at 9:00 + 11:00. Our vocalists and instrumentalists are rotated throughout the month. You are expected to be on stage ready to rehearse at the scheduled rehearsal time. Punctuality is of utmost importance to maintain our rehearsal and service flow. If you will be late, please contact your worship leader. If an emergency occurs and you will not be able to serve, please contact your worship leader immediately. One of our highest values is a culture of engagement with our people. All team members are required to be present and engaged in one of the services during the sermon. If you are ready and willing to fulfill the expectations and commitment, fill out the application below! If you checked "other" above, please specify. "Regular attend" refers to your attendance for the last three months. If you selected "yes" above, who is your small group leader? If you selected "yes" above, please list where you are serving and how often. If you selected "yes" above, please share how you came to a saving faith in Jesus. What are some specific ways you have been growing in your relationship with Christ since accepting Him? Our production team is a dynamic ministry that supports the worship team and service production. We are the caretakers of the delivery of the message of God’s Truth, and aim to create a distraction-free environment of worship that helps point people to Jesus. Our team is composed of several different roles. Below are some of the main categories and descriptions for each. The lyric operator is in charge of leading our congregation and worship team by effectively displaying lyrics, triggering videos, and displaying the message points of the sermon. The camera operator is in charge of visually recording the message so those who cannot make it to church, or those who may be interested in our church but have not yet attended, have a way to connect to the church body. The audio engineer orchestrates the audio mix the church hears during rehearsals and services. They are also in close communication with the worship leader to help facilitate high-impact worship services. The Service Director carries out the details of the service such as lighting and transitions. This role is key as we strive for excellence in our services. Harvest must be your home church. You should be in agreement with our theological standings, doctrine, and values. We are looking for trustworthy, team-minded people who will take the commitment seriously. Maintaining a humble, teachable attitude is very important. There is a standard of purity and holy living that is also expected of production team members. None of us have arrived at perfection, but there needs to be a strong correlation between what you profess on stage and how you live. Whether we like it or not, people are watching us as leaders and our witness is very important. (This includes what we post on social media.) Previous experience on a production team can be helpful but is not required. We currently provide production for two services: Sundays at 9:00 + 11:00. You are expected to be ready to rehearse at the scheduled rehearsal time. Punctuality is of utmost importance to maintain our rehearsal and service flow. If you will be late, please contact your worship leader. If an emergency occurs and you will not be able to serve, please contact your worship leader immediately. One of our highest values is a culture of engagement with our people. All team members are required to be present and engaged in one of the services during the sermon. If yes, please describe your training/experiences.